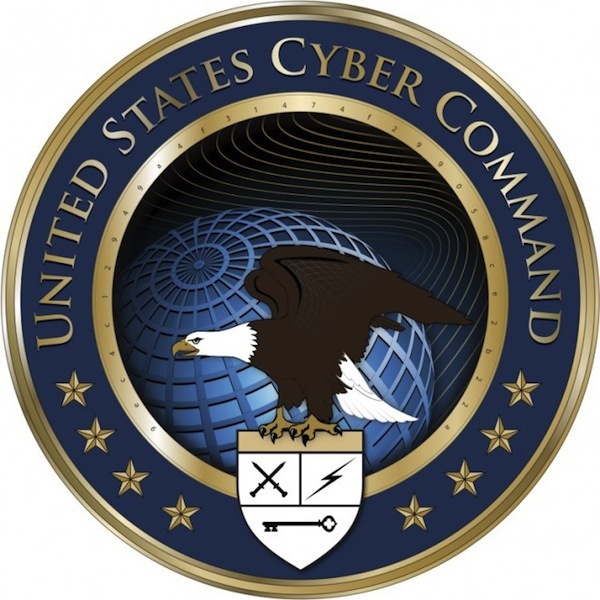 The logo of the newly-formed U.S. Cyber Command, which has a coat of arms of sorts on it, also has a code in its inner gold ring. Wired's Danger Room blog has announced a contest and will give a free tee shirt to the first reader to crack the code. At this point, though, apparently not even the folks at the U.S. Cyber Command know what the code means. They only know that it is said to contain the mission statement of the Command, or maybe just a part of it. 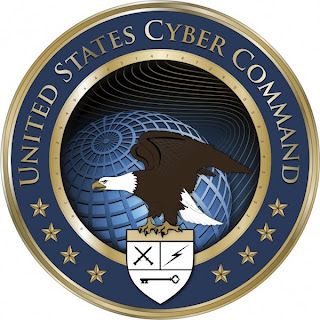 The whole mission statement is: "USCYBERCOM plans, coordinates, integrates, synchronizes, and conducts activities to: direct the operations and defense of specified Department of Defense information networks and; prepare to, and when directed, conduct full-spectrum military cyberspace operations in order to enable actions in all domains, ensure US/Allied freedom of action in cyberspace and deny the same to our adversaries." Which is a lot more characters than contained in the 32-character code. The other mystery (besides the code) is the design of the coat of arms contained in the logo, which I would blazon as: Per fess, the chief portion also per pale, argent, argent and argent, a pair of swords crossed in saltire, a lightning flash bendwise sinister, and a key fesswise wards to base, all sable, a chief or. It's a a bit messy, uses an unusual field division, is overly complex, and has metal on metal (the gold chief on the silver field). And it's contained within the larger logo. I suppose I should just be grateful that they're using some sort of heraldry, but I have to think that it could have been done better. I found you while Googling to try and confirm what I thought about the blazoning of the device in question. I puzzled over this yesterday, and found out that the string of hexidecimal digits is an MD5 cryptographic hash of the entire text of the USCYBERCOM mission statement. I figured they were inscribing it on the annulus as Scottish clans place their mottoes on the garter, so it made sense to me that it was their motto, which in the US Military is a mission statement. Party per fess Argent a key Sable fesswise wards to base per pale two swords in saltire Sable a flash Sable a chief Or the crest a Bald Eagle proper addorsed. An annulus Or inscribed 9ec4c12949a4f31474f299058ce2b22a surmounted an annulus Azure, bearing to base between eight mullets Or inescutcheon party per fess Argent a key Sable fesswise wards to base per pale two swords in saltire Sable a flash Sable a chief Or the crest a Bald Eagle proper addorsed, inscribed United States Cyber Command Or. I'm not an expert, so I wanted to find the publication of the blazon from the original source, and found the US Military Institute of Heraldry at www.tioh.hqda.pentagon.mil , and they do publish the insignia / badges / arms / blazons they create but have not (yet?) published the blazon of the USCYBERCOM unit -- probably due to challenging people to puzzle out the meaning of the inscription. I saw the metal-on-metal as well, and I have a vague memory of an exception stating that a chief can be metal on a metal base, but I can't point at a particular example demonstrating that offhand. The eagle isn't "addorsed"; it's wings are. I suppose a more complete blazon might be: A bald eagle rising wings elevated and addorsed proper. For the coat of arms, the general rule is that charges in chief will be blazoned before charges in base, just as charges to dexter will be blazoned before those in sinister. Basically, you read a coat of arms like you read a book: left to right, top to bottom. Ah, indeed I tripped up - I had started trying to tierce the field and carried over the charge order from the example of tiercing I had. Thank You Thank You Thank You for the corrections!